The Charlotte Olympia Paloma Pumps are absolutely gorgeous, and I'm not the only one who thinks so. These shoes have been worn by countless celebrities including Emma Watson, Olivia Palermo and Rachel McAdams. They are elegant, feminine, and unmistakably special, granted they definitely are not for the faint hearted at nearly six inches. These Charlotte Olympia heels cost €690 and are available from charlotteolympia.com. 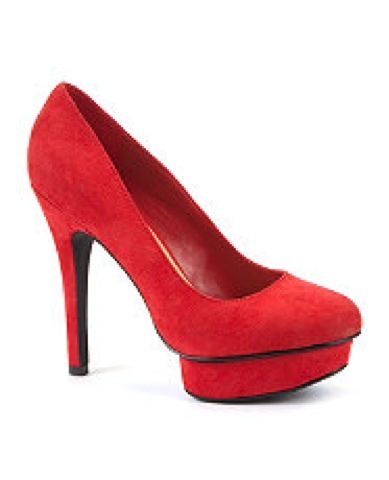 I was browsing the Internet when I stumbled upon the heels below. They are not satin and do not have the same fan detail on the heel, but the do have the signature Charlotte Olympia platform. The signature platform is when the platform is smaller then the sole of the shoe. These does are from the Kelly Brook collection at New Look and cost €30. The original ones look like they were made for vampire movie or something- they're cool! thank you for your email, I highly anticipate with a new blogger on the block! best of luck in yours but to be honest i am more attracted to see how you could style the items that you have reviewed.